The norther Oregon coast experiences considerable winter rain and strong wind. This leads to power outages and flooding. And of course someday the Oregon coast will see another tsunami strike. Amateur radio operators provide emergency communications when disaster strikes and the normal communications systems fail. Some great amateur radio information is avilable at the ARRL web site. Oregon House Bill HB2597 - regulating mobile use of communication devices. An amateur radio repeater is located in the coast range just to the east of Arch Cape. 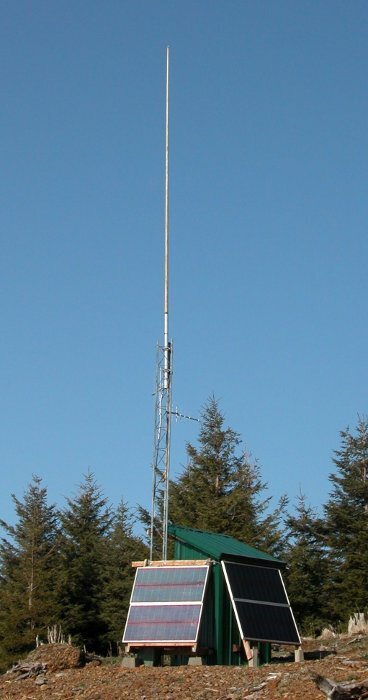 This repeater looks down into Cannon Beach and Arch Cape and provides excellent radio coverage for those areas and also links to repeaters to the north. Visit July 25, 2010 - Door hinge repair. Visit June 12, 2010 - Frozen door hinges. I have a web page here that gives examples of three mobile radio installations that I have done. I made some notes on programming a Wouxun KG-UV3D radio with Linux and have the notes here.